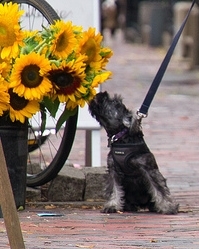 I have just read a great blog by Julie Hecht about making the very best of our dogs’ incredible sense of smell. ‘To get inside your dog’s world, you need to pick his brain—and his nose. Dogs have much more nose than us humans. Their extensive olfactory epithelium allows them to trap and assess odor molecules at concentrations of up to parts per trillion, while we are more in the range of parts per million. Yep. I said trillion. Their noses are about a million times more sensitive than our noses.’ To read the full blog click here. Here is the story of a dog I went to a while ago who wanted his walks to be ‘smell walks’. This entry was posted in behaviour and tagged nose, smell, sniff, walks. Bookmark the permalink.